By 5PM Tuesday, a line of storms will be draped from Interior Maine to central NH, southern VT, and into western MA. Today: Sunshine, highs near 80. Wind from southwest 15-20 mph. Overnight: Mostly clear, big bright harvest moon. Lows near 60. Tomorrow: Sunshine mixing with clouds, a thunderstorm north and west. High in the low 80s. After a soggy second day of our Labor Day Weekend, the holiday itself is bringing drier and warmer conditions, picture perfect for your beach day or outdoor plans. High temperatures will reach into the upper 70s for most, low to mid 70s along the coast as a southwesterly wind at 10-20 mph will keep temperatures slightly cooler there. Tonight, under mostly clear skies south, a few more clouds building in along the Canadian border, lows will only slip into the 60s. Tomorrow, as everyone heads back to work and school after the extended holiday weekend, temperatures will start off in the 60s at the bus stop with humidity on the rise through the day. 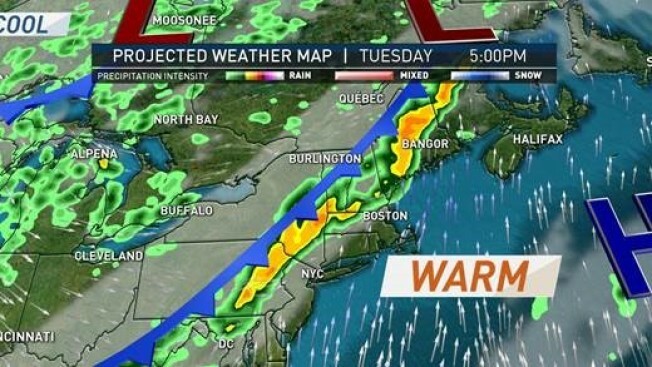 Ahead of a cold front that slides in by the afternoon, clashing with a humid and warm air mass, will create a line of showers and storms ahead of the front. Some of these storms into the afternoon and early evening will be on the strong to severe side with the highest threat being wind and flash flooding under some of the heaviest downpours. By 5PM Tuesday, a line of storms will be draped from Interior Maine to central NH, southern VT, and into western MA. Highs on Tuesday will stretch into the mid to upper 80s. Most of these storms will remain north and west of downtown Boston Tuesday, not so much by Wednesday. The cold front stalls over New England, allowing for more rain for Wednesday, Thursday, even a few chances for showers Friday for some. Showers, heavy downpours at times on Wednesday for SE MA, Cape and Islands, a few more for northern New England through the day and scattered Thursday and Friday. Get ready for a good soaking of rain over the next few days and a cooler end to the work week. Highs midweek onwards shows highs into the 70s, with Friday only reaching near 70. The weekend brings highs near 70 with a slight chance for a shower, not a washout through. The following work week allows highs to reach into the mid to upper 70s with showers possible by midweek. For the tropics, it is still peak hurricane season as Hurricane Irma, a major Cat 3 hurricane, continues to strengthen as she approaches the Leeward Islands, just north of Puerto Rico, and continuing its track westward towards the northern Caribbean by Saturday. This will be an evolving track and timeline as we approach this upcoming weekend. As always, stay tuned with the latest updates on the go with our NBC Boston / necn app. You can get special weather alerts right to your phone.